Nora Gedgaudas from PrimalRestoration.comis a board-certified nutritional consultant and a board-certified clinical neurofeedback specialist with over 20 years of clinical experience. A recognized authority on ketogenic, ancestrally based nutrition, she is a popular speaker and educator and the author of the best selling book, Primal Body, Primal Mind, as well as Rethinking Fatigue. 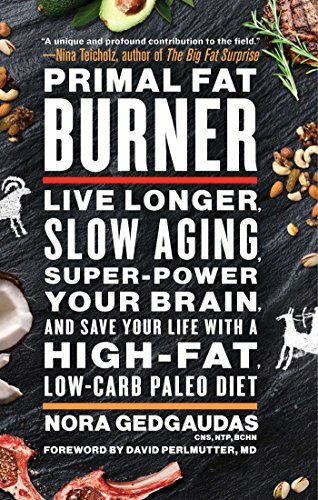 Her newest book, Primal Fat Burner: Live Longer, Slow Aging, Super-Power Your Brain, and Save Your Life With A High Fat, Low-Carb Paleo Diet has been lauded by best selling author and journalist, Nina Teicholz as “a unique and profound contribution to the field.” Her new weekly educational program, Primal Restoration™ is a unique and invaluable source of information benefiting those interested in furthering their nutritional knowledge and optimizing their health. Listen in today as Jimmy and Nora talk about her new book, why eating fat combats aging, how this message goes against the conventional wisdom, how science is catching up with what people in the Paleo community have known for a while, why food quality matters, and how people can take steps immediately to make changes.